Place all grapes in a pot suited to hold the amount you have. Bring them to a boil (don't add water --- they make plenty of juice) while mashing them up a bit using a potato masher. Simmer for 20 minutes until the grapes are very soft. Transfer the cooked grapes in batches to a food mill. Here you have two choices. Turning the food mill the normal direction will give you a very thick grape juice that would compare to extra-pulp orange juice. It can be diluted, but you will still have some "pulp-y" texture to your juice. If you don't mind this, by all means, make the juice this way. You'll use more of the grapes and end up with more juice. Your second choices (the one we choose) is to run the food mill the opposite direction (as if you're trying to skim out the mill). This scrapes the grapes through, giving you mostly juice with a little bit of "pulp." Chill the juice (what comes through the mill) and drink or freeze. You can add water to thin it if you like or use it in its potent form. To Can Straight Juice (per The Ball Book of Complete Home Preserving): Cover and chill the juice for 24 to 48 hours to allow sediment (a.k.a. pulp) to settle. Ladle or pour the juice into a large saucepan, being careful not to disturb the pulp on the bottom or strain the juice through a sieve. Bring the juice to an almost boil (190 degrees F, 88 degrees C) for 5 minutes. Ladle the hot juice into hot jars, leaving adequate headspace. Top with hot lids and screw rings on finger-tip tight. Place jars in canner of boiling water (jars should be covered). Process quart jars for 15 minutes. 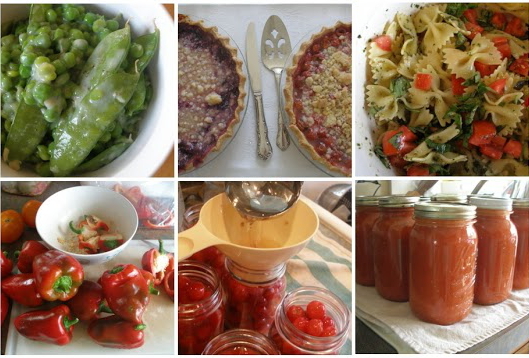 Remove canner lid and boil an additional 5 minutes, then remove jars, cool and store. If this recipe sparks your interest, you may want to check out the entire book. 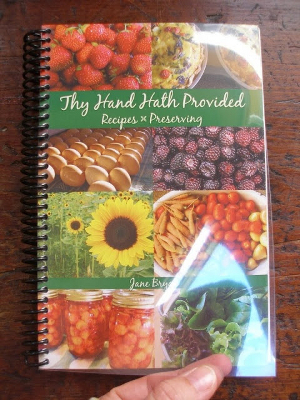 It contains recipes for meals, sides, desserts, drinks, sauces, and preserving by canning and freezing. There's also a handy page of conversions (tablespoons to cups, pecks to bushels, etc. ), pan sizes, and substitutions (eggs to flaxseed, sour cream to yogurt, etc.) in the back. Thanks so much for sharing, Jane! The picture is of a hard copy; where might one locate such an edition of the book? M --- If you click the first link in the post, you'll go directly to the author's website, where you can buy the print edition. I really like spiral-bound cookbooks. They sit flat on the kitchen bench, and if it's a one-page recipe you can turn the rest of the pages under so it takes up half the bench-space. Why aren't they all like that? !